Mohammed Ashfaq is the managing director of Kikit Pathways, a nonprofit that works with the British government's Prevent program to stop radicalization. A ribbon-cutting in Birmingham inaugurated a double-decker bus designed to allow Kikit to go into communities and help people who are addicted to drugs and considered at risk of radicalization. Imran Akhtar visits more than 30 mosques around Birmingham, showing a wide variety of drug paraphernalia to help educate parents about the risks to their children. Akhtar also uses these visits to talk about the risks of radicalization. 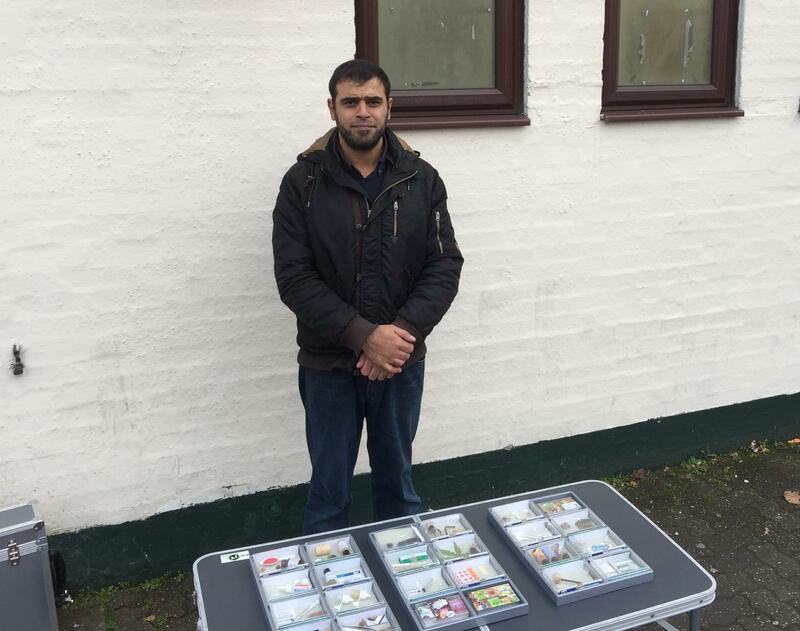 On a recent Friday afternoon, Imran Akhtar set up a folding table loaded with drug paraphernalia outside the Birmingham Central Mosque in the English Midlands. Akhtar's wares included a pair of syringes and a baggie containing a brown substance that looked like heroin. Some 30 feet away, people were showing off more conventional fare, including perfume, hijab and prayer rugs. As worshippers poured out following prayers, Akhtar, a bearded father of three, made his pitch. "We're here to sort of give out advice and information," Akhtar said as people drifted past, eyeing the table tentatively. "It gives you an understanding of what the products look like." Akhtar grew up at this mosque and visits more than 30 others in this city, trying to help parents recognize whether their kids are using drugs. He also warns them that drug use can make their children more vulnerable to radicalization. 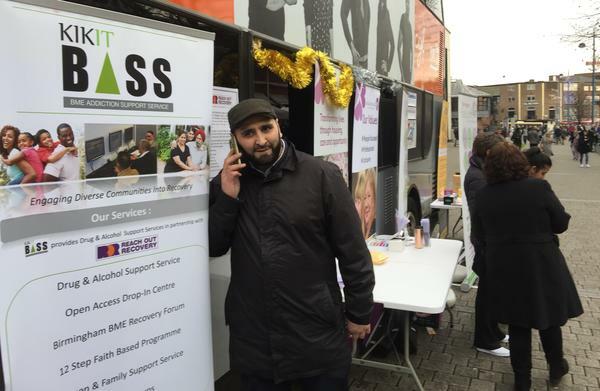 Akhtar, 39, works for Kikit Pathways to Recovery, a nonprofit service that works with the U.K. government's Prevent program to tackle substance abuse and stop radicalization. Earlier this year, London's Metropolitan Police said a terrorist attack in the United Kingdom is not a matter of if, but when. Prevent, which relies on help from everyone from imams to schoolteachers, is designed to minimize the risk that an attack will be perpetrated from within. This year, Kikit mentored more than 60 people in Birmingham at risk of being radicalized, according Mohammed Ashfaq, Kikit's managing director. Ashfaq recalls counseling an unemployed heroin addict in his late 30s, who said jihadist recruiters preyed on his vulnerability. Ashfaq quoted the man describing the way the recruiters worked him. "I was being told that all my life this country was against me," the man told Ashfaq. "And I was put on drugs by the system, and furthermore, the system is currently destroying Muslims." Ashfaq says the recruiters offered the man a solution: become a martyr, all your sins will be forgiven and you will go to heaven. Ashfaq said Kikit provided the man drug and religious counseling, and today, he's clean and working in a restaurant. Ashfaq says Kikit ran the case by Birmingham's local Prevent leader but protected the man's identity, because he wasn't considered an immediate threat. This is one of Prevent's success stories, which rarely make the news because of privacy reasons. Last year, the government expanded Prevent, requiring teachers to alert authorities if they sensed a student at risk. This is one area where Prevent has run into heavy criticism. Miqdaad Versi, assistant secretary general of the Muslim Council of Britain, says Prevent unfairly targets Muslims and the government has done a poor job of training teachers. Versi says it's easy for an uninformed teacher to mistake something offensive — like an anti-Semitic joke — for something more sinister. "I know of an example of a young child who happens to be Muslim who accused a young Jewish child of trying to rule the world," Versi recalled. "That is completely and utterly unacceptable by any standard. But it's not a sign of radicalization. The only reason why it was treated as such was because he happened to be Muslim." Versi says the kid's case was quickly tossed out. Earlier this year, members of the National Union of Teachers voted overwhelmingly for the government to scrap Prevent. They complained the program generated suspicion in the classroom while yielding few results. All of this worries Pinakin Patel, a Prevent coordinator in west London. "I am noticing nervousness from parents and individuals about Prevent," Patel said during a tour of North Kensington, where the ISIS executioner nicknamed "Jihadi John" grew up. Patel says Prevent has accomplished a lot. He says his proudest case involved working with a school and police to turn around two girls who were flying to the Middle East to join ISIS in Syria. Patel says criticisms of the program are exaggerated and what he calls the "anti-Prevent lobby" is scaring people away. "If local communities and organizations start to believe — I'll be honest — the crap that comes out of the anti-lobby, then I'm worried about that because that will stop safeguarding work from happening," Patel says. "It will stop people from being supported." Melanie Smith, a researcher with the Institute for Strategic Dialogue, a London think tank that combats extremism, thinks Prevent has done much more good than harm. But because of privacy concerns, Prevent hasn't shared a lot of success stories. "In a lot of cases, I think it's just communicated badly," Smith says. Unless Prevent can do a better job of proving its value in real terms, it will be hard for the program to win over many of the people it hopes to help. A terrorist attack in the United Kingdom is a matter of when, not if. That's how London police put it earlier this year. That doesn't mean the British government is giving up. It's engaged everyone from imams to schoolteachers in a program aimed at preventing radicalization. It's called Prevent and it's the subject of this first report in a series about counter-radicalization in Europe. Here's NPR's Frank Langfitt. FRANK LANGFITT, BYLINE: It's Friday afternoon prayers at the Birmingham Central Mosque in the English Midlands. Imran Akhtar sets up a folding table outside where he lays out a variety of drug paraphernalia, including two syringes and a baggie full of a brown substance that looks like heroin. As prayers and worshippers stop to chat, Imran Akhtar makes his pitch. IMRAN AKHTAR: Well, we're here to kind of, you know, give our advice and information. So it gives you an understanding of what products look like, first of all. LANGFITT: Akhtar's Kikit Pathways, a nonprofit service that works with the government's Prevent program to tackle substance abuse and a related problem - radicalization. This year Kikit mentored more than 60 people at risk of being radicalized. Mohammed Ashfaq, who runs Kikit, recalls counselling an unemployed heroin addict in his late 30s. MOHAMMED ASHFAQ: The individual started telling us that he was speaking to certain people that were preying on his vulnerability. And when we said - asked what was that, and he would turn around and say, well, I was being told that all my life that this country was against me and I was put on drugs by the system. And furthermore, the system is currently destroying Muslims. LANGFITT: Ashfaq says recruiters offered this solution. ASHFAQ: Because he's never been accepted. And would he like to go to heaven and be forgiven for all his sins? It's something that he should be considering as being a martyr. LANGFITT: Ashfaq says Kikit provided the man drug and religious counseling. Today he's clean and working in a restaurant. Kikit ran the case by the local Prevent leader, but protected the man's identity because he wasn't considered an immediate threat. This is one to Prevent's success stories which rarely make the news. Last year, the government began requiring teachers to alert authorities if they sensed a student at risk. This is where Prevent has run into a lot of criticism. MIQDAAD VERSI: The idea of preventing radicalization seems so simple. Why not have a teacher refer somebody if they think they're on that path? LANGFITT: Miqdaad Versi is assistant secretary general of the Muslim Council of Britain. VERSI: But the reality is if it's done in the wrong way, as it has been in so many places across the U.K., it very well might cause the opposite effect of what was intended. LANGFITT: Versi says Prevent unfairly targets Muslims. And the government has done a lousy job training teachers, who he says can easily mistake something offensive, like an anti-Semitic joke, for something more sinister. VERSI: I know of an example of a young child happens to be Muslim who accused a young Jewish child of trying to rule the world. That is completely and utterly unacceptable by any standard, but it's not a sign of radicalization. The only reason why it was treated as such was because he happened to be Muslim. LANGFITT: And so what happened to the kid? VERSI: It was one of those cases that was referred initially but thrown out very early on. LANGFITT: Earlier this year, members of the National Teacher's Union voted overwhelmingly for the government to scrap Prevent. They complained the program generated suspicion while yielding few results. All of this worries Pinakin Patel, a Prevent coordinator in West London. PINAKIN PATEL: I am noticing nervousness from parents and individuals about Prevent. LANGFITT: Patel took me on a tour of North Kensington, where the ISIS executioner nicknamed Jihadi John grew up. Patel says criticisms of the program are exaggerated and what he calls the anti-Prevent lobby is scaring people away. PATEL: If local communities and organizations that believe, I'll be honest, the crap that comes out of the anti-lobby then I'm worried about that because that'll stop safeguarding work from happening. MELANIE SMITH: I feel like Prevent has done a lot more good than harm in a lot of cases. I think it's just communicated badly. LANGFITT: Melanie Smith is a researcher with the Institute for Strategic Dialogue, a London think tank that combats extremism. Because of privacy concerns, Prevent hasn't shared a lot of its success stories. SMITH: They're not telling people, yes, your concerns are legitimate but we're actually doing X, Y, Z, look at these amazing case studies. LANGFITT: Without doing more to prove its value, Prevent will almost certainly continue to struggle to win over many of the people it hopes to help. Frank Langfitt, NPR News, Birmingham. Transcript provided by NPR, Copyright NPR.